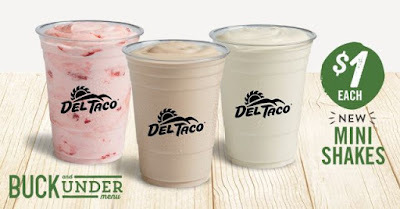 Del Taco adds to their "Buck and Under" value menu with the debut of new Mini Shakes for $1 at participating restaurants. The 9-oz shakes come in the same flavors as the chain's regular shakes: chocolate, vanilla, or strawberry. It appears they don't come topped with whipped cream like the regular shakes though.